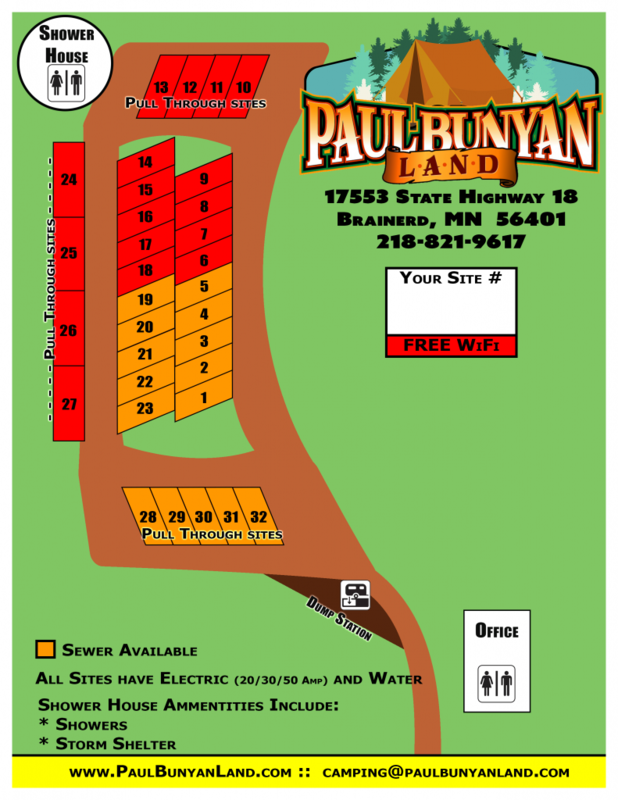 All campsites are available with water and electric (20/30/50 amp). Sewer is available at selected sites. Each site has a fire pit and picnic table for your use. We also have showers and restrooms available for campers. Only one camper per site. Only one car per site. Extra cars must be registered. Campground reservations are advised and a deposit is required to hold each site. Check-in time is 1 pm or after and check out time is 11 am. Cancellation policy: A credit card deposit equal to the registration charges for your first night is required to guarantee a reservation. The deposit is charged at the time of your registration. If you are unable to honor your reservation, call and cancel before the deadline. Deadline is by 4:00 pm Seven days prior to your arrival date. A $10:00 cancellation fee is charged for cancellations made prior to the deadline. Cancellations after the deadline will result in forfeiture of the deposit. No show No call, the cost of the entire reservation will be charged. You are responsible for the whole reservation, even if you leave early. No refunds due to weather. Camping rated include 4 people per site. Each site has water and electric (20/30/50). Minimum two-night stay. Campsites are for registered guest only. Your fees do not include additional visitors. Guest need to register and pay fees at the office upon entering campground. We reserve the right to limit the number of guests. Pets must be on a leash at all times. Limit 2 dogs per site. Dogs must be picked up after. Pets are not to be tied outside of your RV when you are not in the campground and are not to be left unattended at any time. No ground tie-downs permitted. If any pet demonstrates aggressive behavior toward another pet or camper, you will be asked to leave the campground. No excessive Barking! Campfires are permitted in designated fire rings only. Bringing in your own firewood is prohibited. Certified firewood can be purchased from the office.